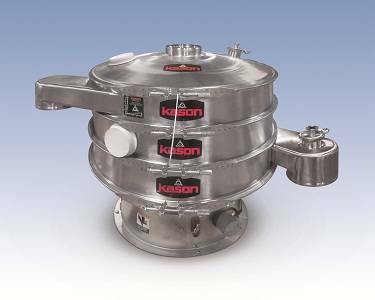 A new sanitary Clean-In-Place Vibroscreen Double-Deck Screener from Kason removes oversize and undersize particles from on-size chemicals, minerals, plastics, foods, dairy products, pharmaceuticals and other bulk materials. The 1016 mm diameter unit contains two horizontally-mounted screens in a cylindrical housing supported on a circular base by rugged springs. An imbalanced weight gyratory motor affixed to the housing imparts vibration, causing oversize particles to travel across the coarse upper screen and exit through an upper discharge spout at the screen’s periphery. On-size particles falling onto the lower screen are discharged through a centre discharge spout, as undersize material flows through the screen, onto a chute and through a lower discharge spout. The screener is equipped with quick-disconnect clamps between each screen frame, providing rapid interior access for inspection and screen changes. An integral Clean-In-Place (CIP) spray wash system employs spray nozzles strategically placed to emit cleaning solutions, rinsing solutions and/or steam for sanitising the interior of the screening chambers without the need to open or otherwise disassemble the unit. The unit is also offered in diameters from 460 to 2540 mm, and can operate on a batch or continuous basis, screening several kilograms to 70 tonnes per hour. In addition to circular vibratory screeners, the company manufactures a broad range of centrifugal screeners, and circular fluid bed dryers, coolers and moisturisers.